The RAF Servicing Commandos were trained to do two jobs. The first was to maintain, repair, refuel and arm operational Allied aircraft during the assault phase of a major landing close to the advancing front line. The second was to vigorously defend themselves and the aircraft in their charge against enemy attack. The additional training they needed for this included two weeks at the No 1 Combined Training Centre, Inveraray on Loch Fyne in Scotland. 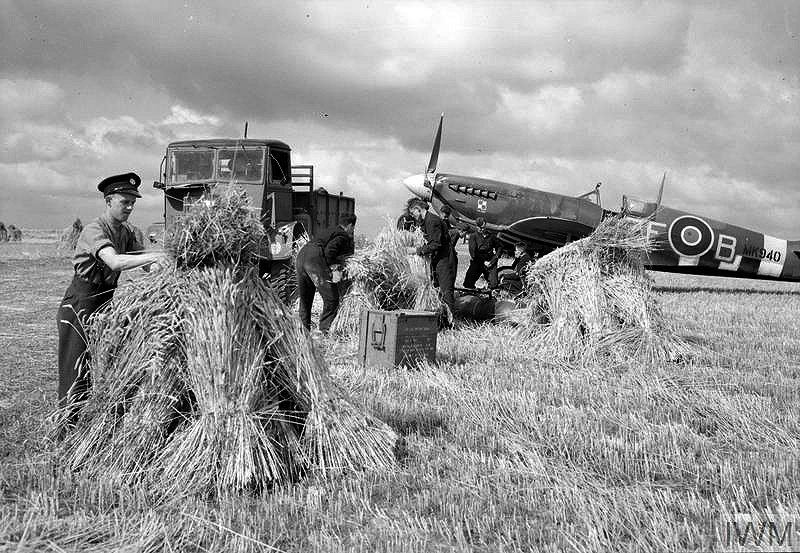 The volunteers were recruited from the service personnel of RAF Squadrons through notices posted at RAF Stations; 'Volunteers wanted in all trades for units to be formed to service aircraft under hazardous conditions.' Despite the lack of detail, there was no shortage of volunteers prepared to undertake their vital work in the battle grounds. Planners identified a need to provide forward aircraft servicing support during the assault phase as the Allies advanced through enemy occupied territory. It would take time for squadron ground crews to reach forward positions so small self contained, mobile servicing units were needed to fill the gap. A memorandum from the War Cabinet Annex in Whitehall to the MOD, dated 27/1/42, recommended the formation of an RAF Servicing Commando Force. The memo was signed by Lord Louis Mountbatten, Commodore of Combined Operations. 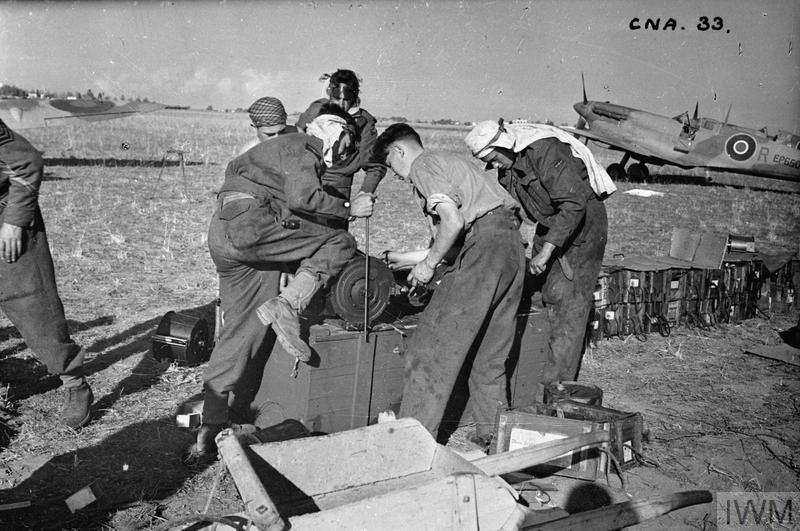 The Commandos were required to set up operations, under fire if necessary, including fuel, spare parts and ammunition for the servicing of engines, guns and air-frames... and all from tools and equipment carried through an assault landing! They would also assist during assault landings as necessary. Fifteen such units were formed, each commanded by an engineering officer and usually with an armament officer and an adjutant. Each unit comprised about 150 men organised into four flights similar to army platoons. There was a flight sergeant with corporals as section leaders. A sergeant was responsible for each trade, such as engine, airframe and armourers. Fifteen 3-ton trucks held each unit's equipment and personnel when on the move. There was also a 15 cwt (3/4 of a ton) vehicle, a jeep for the Commanding Officer and a motorcycle for the unit despatch rider. Airmen were armed with Sten guns or rifles and each flight had a Bren gun. All ranks undertook military training, supervised by Army Officers seconded for the purpose. Their training included driving and swimming, the former because they were a mobile unit and the latter because they would be involved in amphibious landings. After this initial 'toughening up' training, they spent two weeks at the Combined Training Centre (CTC) at Inveraray in Scotland. CTC Inveraray specialised in minor landing craft amphibious training but was also a location for Commando training . 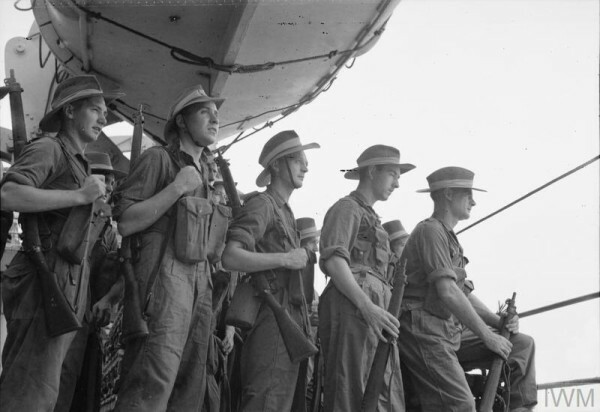 Here the volunteers trained to safely embark and disembark landing craft, including the use of scrambling nets, together with physically demanding assault exercises in the surrounding rugged, mountainous countryside, which usually followed mock landings. 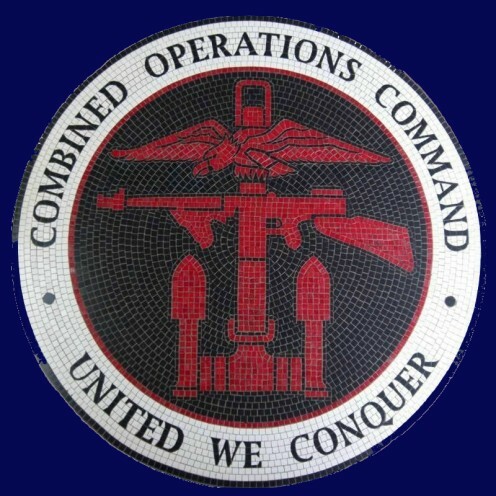 On completion of this training, the coveted Combined Operations badge was issued. During the following few months, the units frequently moved from airfield to airfield to gain experience of servicing a wide range of aircraft including Spitfires, Typhoons, Mustangs and Mosquitoes. Each Commando Unit had a mobile workshop, which was amongst the first vehicles to go ashore in assault landings, while fuel tankers and ancillary vehicles landed later in the day. The object was to establish a landing strip ready to receive aircraft flying in support of the ground forces. The Mediterranean. Commando Units 3201, 02, 03 and 04 took part in operations in North Africa, Sicily and Italy. In addition 3230, 31 and 32 trained in Palestine and served in Sicily and Italy. Normandy. 3205, 07, 09 and 10 embarked at Gosport on the south coast of England early on the morning of 6th June, 1944. They crossed the Channel on an American Landing Ship Tank (LST) and several Landing Craft Tank (LCTs), one of which was torpedoed and set on fire during the crossing. Two airmen were injured but they returned safely to England by naval craft along with others rescued. South East Asia. After withdrawal from Normandy, the four units (3205, 07, 09 and 10) embarked for passage to South East Asia. However, the operational life of the units came to an abrupt end with the unexpected surrender of Japan on 2/9/45. Operation Zipper, the invasion of Malaya, in which they would have been involved, was cancelled with the ending of the war. Commando Unit 3201 trained in the UK and landed in North Africa on D-Day at about H + 60 minutes and reached Maison Blanche airfield at 09.10 hrs. When not involved in assault landings, the unit worked alongside aircraft recovery units. They were in Sicily in 1943 and Corsica in January 1944. Their CO throughout the 2.5 years was Flt Lt H Webster, who made this critical comment... the unit was misused after Sicily, no one on the staff knew its capabilities. More information here. Commando Unit 3202 trained in the UK and served in North Africa and Italy. It was disbanded in December, 1943, at Taranto, Italy. Commando Unit 3203 trained in the UK and served in North Africa, Sicily and at Salerno in Italy, where they serviced any fighter aircraft that came their way. They were disbanded at Portici, Italy in February, 1944. 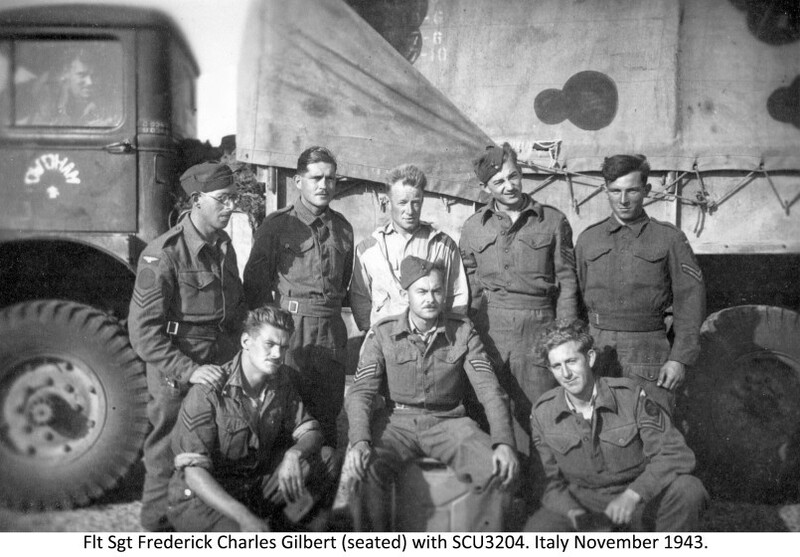 Commando Unit 3204 landed in Sicily in July, 1943 and disbanded at Catania, Sicily on 3/2/44. Commando Unit 3205 embarked at Gosport early on the morning of 6/6/44. They landed on the Normandy beaches on D+1. One vehicle hit a mine on leaving the landing craft, resulting in 2 fatalities. The unit serviced Spitfires during June. They sailed for India on 2/11/44 with 07 arriving in Chittagong, India on 5/12/44. They landed at Akyab in January, 1945 from Landing Craft Mechanised (LCMs). They subsequently operated on the Arakan peninsula. In early September, 1945, the unit was at sea bound for Morib in Malaya. As planned, they landed there on or around September 9th a few days after the surrender of Japan. Their landing was unopposed and they moved on to Kelanang. Later, the unit was posted to Batavia, now Jakarta, in Java, by way of Singapore. They were disbanded on February 28th, 1946. Commando Unit 3206 landed in Normandy on D + 10 and operated through France to Belgium. They were disbanded in April 1945. Commando Unit 3207. The day by day account below was written by Sgt Tom W Edwards, 637669, RAF Servicing Commando Unit 3207. He landed on Gold Beach on D Day plus 1. Apart from expanding abbreviations and acronyms, for ease of understanding, the entries are as written by Sgt Edwards. June 5 14.00 Left camp area for mooring area. June 6 04.00 Left mooring area for embarkation area (Fareham). Last on D Day! 11.30 Embarked. June 7 08.40 French coast sighted.13.00 Hove to five miles out. Anti aircraft activity in night. No enemy aircraft. Fire in aft hold put out. Received American cigarettes, chocolate and gum ration. % of unit landed on Landing Craft Tank (LCT) and % torpedoed off coast LAC killed (Leading Aircraftsman). Turkey for dinner. Grapefruit, fruit salad and white bread for previous meal. 16.00 Landed on beach and wagon bogged in sand and eventually towed clear by Royal Engineers (REME). Proceeded vehicles to assembly areas and first French sign was a notice “Pension Famila” on a house. Local inhabitants waved and cheered. Proceeded to Rest and Recuperation Station (RRS) and slept in wagon. Heavy ach-ach overnight. Bazenville. June 9 Fairly easy day. Stores, ammo & octane coming in from beaches. Inspected dump of German Tellermines & stick grenades. Heavy ach-ach overnight. June 10 Exceptionally busy day preparing changes on strip. French women snipers reported in locality. Seafire and Typhoon crash landed on strip. June 11 Runway unusable. Reccy for German. Liberator touched down and crew, apart from 2, baled out. Royal Engineer caught sniper in woods at rear of strip. He had been supplied with food & clothing by French civilians. Obtained eggs from French farmer for ten francs late in evening. First squadron on strip - Spits. 06.30 Five Dakotas landed with WAAF orderlies. Two Thunderbolts landed - one pranged. Two Mitchells shot down in evening by anti-aircraft fire. One Typhoon pranged. Two Typhoon squadrons and one Spitfire squadron and five Mustangs. Two Typhoon and one Spitfire squadron in. Heavy ach-ach overnight. 365 sorties for the day. Three Focke Wulf 190s hedge hopped with twelve more above them over strip. More Dakotas arrived to transport wounded. One German soldier had lost two eyes and a hand. Air Force took over at midnight. Two Typhoon and two Spitire Squadrons in. Liberator & Lightning, both shot up, landed on strip. Left strip at 3pm for Vaux-sur-Seulles. Went to village in evening and had cognac and citroen. Total prangs on strip for five days - Five Spitfires, Four Typhoons. Day of rest. Haircut, hair washed, bath in bowl and two sets of laundry cleaned. Petrol, ammo & oxygen in for strip in evening. Convoys in during day with stores for new strip. Went to cafe in village and indulged in vin blanc and black coffee. 15.45 Strafed on strip while unloading stores by six Focke Wulf 190s. Heavy ach-ach. Junkers 88 crashed 1/2 mile away and bomb load exploded. Went to Vaussiex and had six vin blancs in cafe. Went over to crashed aircraft in evening. Wreckage and bodies strewn over wide area. Main Caen-Bayeux road shelled in afternoon 1/2 mile from strip. 19.30 Unidentified aircraft crashed near strip and five of crew baled out safely. Formation of Mitchells seen over Caen flying through heavy anti-aircraft fire - one shot down. Machine gunned on strip by Focke Wulf 190 at 15.00 flying at zero feet. Corporal Boyce opened up with Bren gun. Operated on 19 Squadron Mustangs. Nothing exceptional. Work on Mustangs. Four ME 109s came in low over site at 13.45 and opened fire without causing casualties or damage. Moved to RSU Meuvaines at seven p.m. Crash strip - which first aircraft landed in France. Crated 12 aircraft for return by Landing Ship Tank (LST) to England with USA Fisher100 & 75c aircraft and cargo. Inspected dump of 28cm & 32cm Incendiary Rocket Bombs & Bangalore Torpedos. Carried on with armament maintenance. Cleared lanes for aircraft category lines. Prepared machine guns and carriers for shipping. Demolished Bangalore Torpedo & Rocket Propelled Heads. Saw Lancasters & Halifaxes go in over Caen. Heavy anti-aircraft fire, 2 Lancasters shot down, crews baled out. Visited Bayeux. Brought gifts; slips 400f, blouse 150f, stockings 165f, handkerchiefs 38f. Amazing experience. Organised classes for Mines Exhibition at Bayeux. Heavy fire over Caen on all three nights. JU (Junkers) 88 machined gunned beaches. Visited Caen to collect & dispose of German target indicators from Cargoes. Whole village blasted and all buildings destroyed. Dead horses and cattle in farmyards. Personal belongings & property left in houses and air of desolation everywhere. Caen finding its feet again. 19.30 Dog fight overhead. Enemy formation in clouds scattered when Spitfires appeared. ME109 shot down by Spitfires and pilot baled out. After 18 year old Tom Edwards joined the RAF in early 1939, he served in many RAF Stations and other locations including Cranwell, Manby, Donna Nook (Hawker Demons), Farnborough, Hullavington (Maintenance Unit), Zeals, Redhill (3 Bomb Disposal Squad), Carew Cheriton (43 Bomb Disposal Squad), Manston, Tangmere, West Hampnet, Shoreham (Rest & Recuperation), Inveraray (Commando Training), Normandy (landing on Gold beach on D Day + 1), Eastchurch (Isle of Sheppy), Egypt (Masarah Maintenance Unit) and Palestine (Coastal Bombing Range). He volunteered for bomb disposal training and from Redhill took part in 17 operations between 24/12/40 and 14/05/41. In 1943 he volunteered for service of a hazardous nature in the RAF Servicing Commandos. In December 1944, 3207 arrived in India, spending Xmas 1944 at Imphal where, together with No 3 R&SU, they engaged in recovery and salvage work. In February, they moved by road to Monywa, where part of the unit was later flown into Meiktila in Burma. Here, they occupied a landing strip inside a defensive box. They were joined by the RAF Regiment, who assisted in the defence of the box. During this period, both Sgt. Brown and Nobby Coxhall, who had served in Normandy with 3209, earned the Military Medal. The part unit was withdrawn from Meiktila on 29/4/45. After the fall of Mandalay, the unit left for Mingladon which, by then, was securely in Allied hands. They then moved to Rangoon where they took part in a victory parade. They then sailed to Singapore, arriving there on September 5th. Prior to being disbanded (possibly at Kallang) on 31stMarch 1946, 3207 serviced planes used to repatriate ex POWs (prisoners of war). Commando Unit 3208 landed in Normandy on D + 10, where they serviced Mustangs and other aircraft. They moved to forward airfields with the advancing Allied troops and serviced Mosquitoes covering the Rhine crossing. They were disbanded in March 1945. Commando Unit 3209. Most of 3209 sailed from Gosport on an American LST with the remainder of the unit on an LCT together with all the unit's cooking equipment. Unfortunately the LCT was sunk by enemy action and two airmen were killed and others injured. Most were picked up by naval craft and returned to England but one member was deposited on his designated landing beach in Normandy ahead of the main body of men. On their arrival, he admonished them with, “Where have you lot been?”, while resplendent in a naval jersey given to him by one of the sailors! 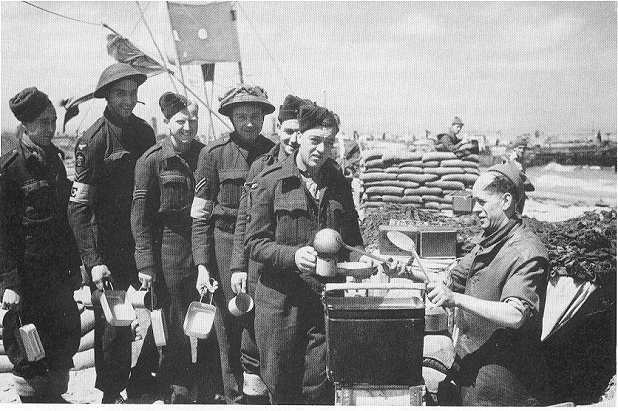 Because the unit had lost all its cooking equipment, for several weeks they survived on canned compo rations delivered to them on crates containing food for 14 men for one day. For cooking and heating water, they used empty motor transport fuel cans, cut in half, filled with earth and soaked in petrol. When replacement cooking equipment arrived, the unit cooks resumed their duties. The units operated mostly on the B2 and B3 landing grounds in Normandy, returning to England at the beginning of August. They were given leave before sailing for the Far East at the end of the year. On landing in Bombay in January 1945, 3209 spent some time in a transit camp possibly called Worli. From there, they crossed India to Singabeel in the state of Assam; to Calcutta, for a short stay on the Midan; back across India to a Seaplane base at Korangi Creek on the coast not far from Karachi. Here they underwent some training on landing craft but spent most of the time swimming! Once more across India to Bobbilli on the coast north of Madras, where they waited for the delivery of some Bedford trucks, then down to Madras and aboard a Tank Landing Craft (TLC) to Rangoon. They were scheduled to take part in Operation Dracula... the seaborne assault on Rangoon but this was cancelled upon the surrender of the Japanese in early September 1945. 3209 was then split up and never again operated as a unit. A Squadron (1 and 2 flights) sailed to Rangoon from Madras and then to Bangkok by landing craft, where they established a staging post for servicing visiting aircraft. B Squadron (3 and 4 flights) sailed from Rangoon to Saigon on board the troop ship 'Silesia.' It was not altogether safe, since Nationalists fired on a following vessel on the Saigon River. They established the No 2 staging post for aircraft en-route to Japan and also took part in airfield defence against insurgents seeking to prevent the return of the French. The squadron also patrolled the countryside looking for terrorists and arms and they provided a guard of honour for Lord Louis Mountbatten on his arrival in Saigon. 3209 was disbanded on 22nd November 1945 and members were posted to RAF units throughout South East Asia. Commando Unit 3210 landed in India on 14/1/45 and, after training at Worli, moved to Calcutta. Flights were employed at various stations until orders came through to prepare for Operation Zipper. However, the surrender of the Japanese on 5/9/45 changed everything. In mid September they sailed to Malaya on board the SS Dunera and on the 17th, they transferred to landing craft off Morib beach, having to negotiate four feet of water and a nine mile march to their assembly area! On this subject reader Neville Colfer writes; The SS Dunera arrived off Morib Beach on the 9th according to the log of my father's RAF squadron - the 89th Squadron. They also transferred to LCIs and then another transfer to smaller landing craft before wading ashore on the afternoon of the 9th. They set off on a 10 mile march to a transit camp at Telok Datok, same one as the 3210, I expect. But it was too late in the day and so they were ordered to bivouac. It was so dark they couldn't see where they were setting up their tents. Unfortunately, some erected their tents on a dry river bed which, unbeknown to them, was subject to flash flooding. They woke up during the night in several inches of water! Overnight monsoon rains thoroughly soaked them and all their kit. When they arrived at Telok Datok, which was no more than a collection of huts, it took two days to dry out! Their orders were to prepare airstrips at Port Swettenham or Port Dickson, ready for operational duties by the 15th September when new mosquitoes were due to arrive. This was also what, I expect, 3210 were going to do under fire, if opposed. However, all that had changed, of course, with the end of the war. With war plans abandoned, the 89th Echelon received new orders on the 23rd of September to "Make your way to Seletar, Singapore". 42651 personnel and 3968 vehicles were landed on Morib beach according to a monument erected there by the 46th Indian Beach Group. Aircraft were serviced at airfields in Port Swettenham and Kuala Lumpur's Kelanang airfield. On the 21st of September, a move to Batavia in Java was intimated and, shortly thereafter, they sailed from Port Dickson to Batavia, with their vehicles, aboard four LCTs. On arrival they took over airfield defence from an army detachment and serviced incoming aircraft and, initially, two squadrons of Thunderbolts. With little notice, the unit was disbanded on 31 October, 1945. Commando Unit 3225 was formed in the UK in July 1943 and served in Egypt around the end of 1943. Commando Unit 3226 was formed in July 1942. They served in Sicily and Salerno, Italy where, despite the airstrip coming under enemy fire, petrol was brought up from the beachhead area. After further service, the unit was disbanded in January 1944. Commando Units 3230 and 3231 were formed in Palestine (Egypt?) in the Spring of 1943. They were deployed to Sicily and the toe of Italy before being disbanded in November 1943 and January 1944 respectively. Gordon Taylor was a member of 3209 on D-Day and recorded these thoughts on 24th July 1944. His early involvement in the war was seriously interrupted by a German torpedo! Monday 5 June Left Salisbury at 13.00 hrs and arrived in Portsmouth area after travelling all day. Loads of work. Collected 24 hour ration packs and changed money into francs, £2.00 and received 400 francs. Bed about midnight tired out. Tuesday 6 June Up at 02.45 hours and away by 05.00. With only a few of my mates (unit split up). On landing craft by 10.00 hrs. Moved off at 14.00 hrs. to join the rest of the convoy at about 22.00hrs. Bed down in lorries to sleep. Wednesday 7 June At about 02.00 hrs gunfire heard, all boys reached for tin hats. Suddenly there was a terrific crash and a tremendous yellow flame lit the whole place up. In a few seconds there was a large fire going. All I remember was that I found myself wandering about the deck. Most of the boys had, by now, got over the first shock, and were standing well to the front as the fire was spreading and had reached ammunition which was exploding. I went to the front and found that we were not sinking so I decided to stay on a little longer. Two chaps, Canadians, dived overboard. I don't think that they were picked up or seen again. The fire was well alight and we could see chaps trying to get out. I don't think they did. We could not get down the other end because of the fire and the damage to the side of the ship. The front half was now rocking about badly as its back was breaking leaving the top plates holding the two halves together. Suddenly a motor launch came out of the blue telling us to jump into the water. Not a bad idea but some of the boys' life belts were punctured by the blast. It then came closer so that we could jump aboard. It took about ten chaps - two fell into the water but were picked up. We did not think that it was corning back again but it did a few minutes later and I was last but one. At the other end of the boat they were trying to put the fire out but no water came through the fire hoses. On the rescue boat I went below after feeling a pain in the head from which blood was flowing. The boat was crowded with chaps who were badly burned. All of us were sick in the following hours. I went on deck after my head was bandaged and all I could see were hundreds of craft of all sizes. The French Coast stood out very clearly in the background. The boat went up and down the coast looking for a hospital ship but when we made contact it was full. We were then transferred to an LCT, which had another in tow. We stayed with this until we were again transferred to an American LST on its way back to England. Those of us not too good were put to bed and given anti tetanus injections. Had some lovely coffee and tea. Tried to sleep but there was lots of noise. Thursday 8 June Arrived back in England at about 3 o'clock in the afternoon and was taken to Winchester Hospital. And was soon asleep. Gordon was transferred to hospital in Bradford and was eventually posted to 141 Wing HQ at West Mailing. RAFSC 3201 - 1035703 LAC Stanley Arthur Gallagher. RAF (VR) 22 November 1942. Age 22. Medjez-El-Bab War Cemetery, Tunisia. GC2. RAFSC 3206 - 1384610 LAC Leonard Charles Lansdowne. RAF (VR) 12 September 1944. Age 32. Marissel French National Cemetery, France. Grave 324. RAFSC 3226 - 1107082 CPL Hugh McCulloch Montgomerie. RAF (VR) 11 August 1943. Age 26. Catania War Cemetery, Sicily. IF 46. RAFSC 3232 - 1233431 AC1 John William Cannon. RAF (VR) 21 June 1943. Age 22. Malta (Capucchini) Naval Cemetery, Malta. Prot Sec (Men's) Plot F Coll. Grave 36. Royal Air Servicing Commando Unit 3201. A light hearted account of hazardous duties illustrated with cartoon images drawn by the author. The RAF Servicing Commando and The Tactical Wing Association In 2006 the RAFSC Association joined forces with today's Tactical Supply Wing to form a new association representing a common heritage. New members are welcome. A History of the RAF Servicing Commandos, by J P Kellett and J Davies, published by Airlife in 1989. ISBN 1-85310-051-X. Spectacles, Testicles, Fags and Matches - the untold story of the RAF Servicing Commandos in World War Two. Written by Tom Atkinson. Published by Luath Press Ltd, Edinburgh in 2004. The author was a member of RAFSC Unit 3210. 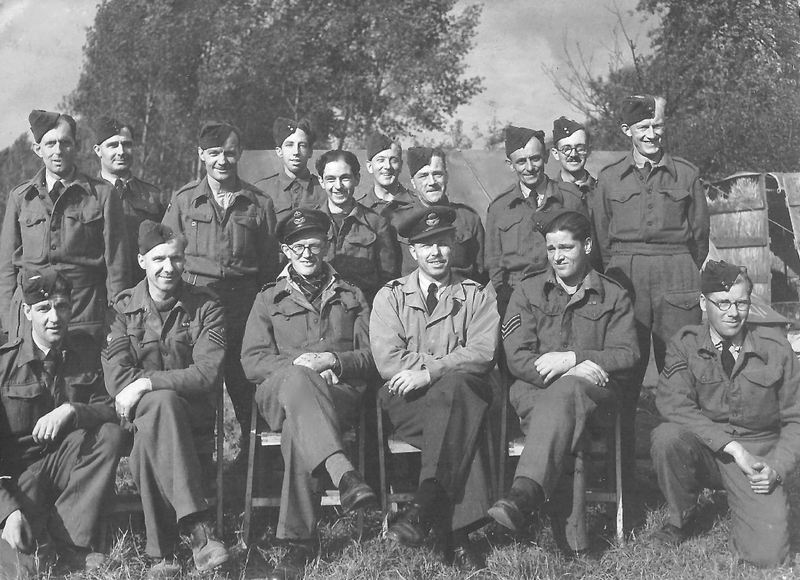 My Father, fourth from left back row in the photo opposite, was in the 2nd TAF 121/122 Wing in the RAF Servicing Commandos. He went over to France on D-Day +2, I think to the airfield at Le Fresne Camilly. From there he progressed up to Volkel in Holland ending up in Copenhagen. His official role was as a shoemaker, repairing flying boots etc but also building, repairing and defending the airfields. The photo was taken in Holland in October 1944. My grandfather was J P Kellett who co wrote The History of the Servicing Commandoes when I was a little girl. I remember him spending many hours clunking away on an old type writer in the spare room, much to my Nan's annoyance at times. He mainly wrote it because he felt people may forget the servicing commandos ever existed in time. My uncle found his book in the Australian RAF museum so I am guessing he did his part to stop that happening and I thank you and the others who have set up this website for doing the same. I will very much enjoy spending time visiting and reading all the interesting articles in it and thank you again for keeping this part of history and a part of my granddad I am extremely proud of, alive. Copies of the book are usually available through the 'ABE' link under Further Reading. My uncle, Rod Davidge, flew with RAF 193 Typhoon Squadron through to September 1944. On June 17th, 1944, Rod was hit by flak at 15,000 feet while on a bombing mission over Thury Harcourt, about 20 miles from the Normandy beaches in an area south of Caen. The day before they had lost their Wing Commander, R. Baker, while bombing targets in the same area, so Rod was now the leader of the group. 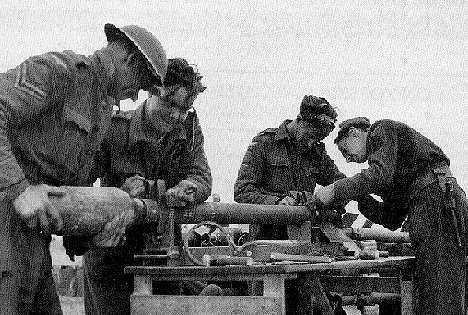 After the strike, the squadron were re-grouping when Rod was hit by flak. He was a relatively easy target as he flew straight and level while waiting for the others to re-group on him. He handed over the lead to the next in line of command and shut down his engine to reduce the risk of fire since one of his fuel tanks had been hit. He considered bailing out but since he was over enemy territory, he opted to glide his Typhoon towards the coast where Allied forces had taken up position. He noticed an airstrip under construction and made a dead stick landing at what was to become "B6". His plane raised a lot of dust but he was grateful to be alive and on the ground. As he casually stepped out of his aircraft nearby service personnel yelled at him to take cover just before German artillery opened up on their position. When the action was over, he was greeted by the Servicing Commandos, possibly 3205 or 3206. They quickly assessed the damage to his aircraft and within a short time he was ready to go with a patched fuel tank and enough fuel to reach England. He may have been the first to land and take off at B6. He returned to his operational base in the UK later that afternoon in time for dinner! His squadron mates thought he'd bailed out, crashed landed, was captured or even dead, so they were very surprised and delighted to see him in the flesh. He has always spoken very highly of the Air Servicing Commandos who helped him that day. At the time of the incident he had no prior knowledge of the SCs but was so grateful for their support at his time of greatest need following his own brush with death and the recent loss of his close friend. 193 Sqd. later relocated to B3 where he continued to fly until the end of his 2nd tour. He was repatriated to Canada in the fall of 1944 where he continued to fly for the RCAF as a trainer. He also patrolled the skies in Hawker Hurricanes in Western Canada searching for Japanese Balloon bombs. At the age of 94, he has had a wonderful life and continues to live in Ontario. 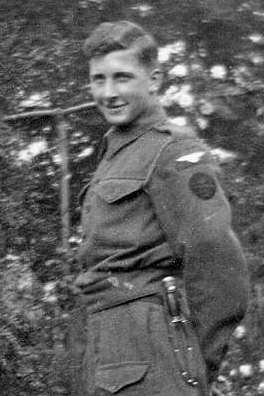 It would be exciting to find any record or information of Rod’s landing and the repairs he received from Servicing Commandos. If you can help, please click on the e-mail link opposite. This account of the RAF Servicing Commandos was written by Ed Stevens with additional material from others.